When movie fans think of John Ford, the first things that typically come to mind are John Wayne and the grand landscapes of the Old West. Both are present in Ford Apache, the first entry in his cavalry trilogy. It was followed by She Wore a Yellow Ribbon and Rio Grande. Wayne stars in all three films, and he stands tall in each one. He was 41 years old when this movie arrived, and this character differs considerably from the grizzled veterans of his later career. He's the kinder upstart to the serious Henry Fonda this time, and it reveals a different side of Wayne from his expected persona. His screen presence is as strong as ever, but standing up to a powerhouse like Fonda is a tall order. 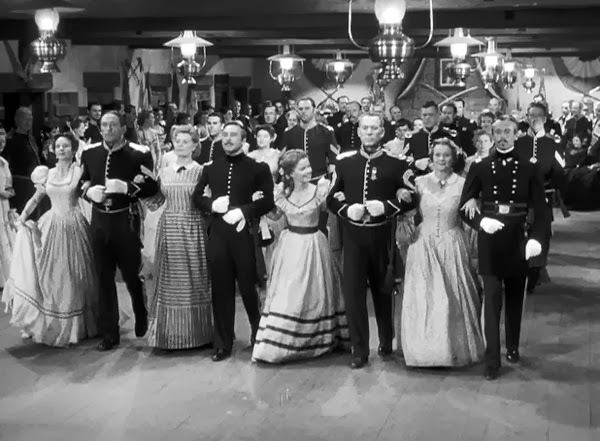 Lieutenant Colonel Owen Thursday (Henry Fonda) arrives at the U.S. cavalry post of Fort Apache to take charge. His daughter Philadelphia (Shirley Temple) joins him and sets her sights on the young Sergeant Major O’Rourke (John Agar). Trouble looms from the Apache tribe and its leader Cochise (Miguel Incan). Thursday’s hardline stance against the Native Americans contrasts with Captain Kirby York’s (John Wayne) friendlier approach. His tunnel vision puts them into a conflict that could have disastrous consequences. This is the most intriguing perspective on U.S. history that I’ve witnessed in this marathon. Ford and Writer Frank S. Nugent (in his first screenplay) spend the first hour glorifying the cavalry and then work to tear it down. Thursday is a thinly veiled fictional version of George Custer, who also went to West Point and was a Civil War general. Beyond its connection to the famous “last stand”, this film reveals possible falsehoods in American mythmaking. Despite his disastrous tactics, Thursday is set up as a hero. The heroic painting presents a man who stubbornly led his men to slaughter like a champion. Similar to the “print the legend” statements in The Man Who Shot Liberty Valance, this misleading exhibit reveals surprising complexities in this western tale. Ford uses exteriors like Monument Valley to remind us that danger lurks in every corner. When O’Rourke and Philadelphia take a friendly ride, they’re jolted back to reality at the sight of trouble. York takes a daring journey to meet with Cochise, and it happens in a rocky stronghold. The Apache tribe owns the wilderness, and it’s foolish for Thursday to think that he can best them with soldiers out of their element. Ford mixes grand outdoor shots with studio footage, and there are awkward transitions. Even so, the bleak setting creates a sense of foreboding that the cavalry may not be ready for battles to come. 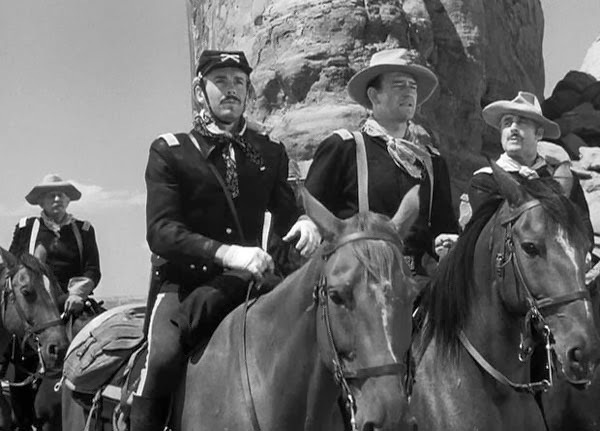 If there’s a downside to Fort Apache, it’s the uneven treatment of the characters. We spend time building up the romance between O’Rourke and Philadelphia, then it disappears for a while. York plays a key role in the final act, yet doesn’t have much to do until that point. A letter arrives minutes too late to save one soldier, but we barely know him. The saving grace is fine work from the actors, particularly Fonda and Wayne. They don’t get too many scenes together, but they make the most of the ultimate conflicts. Wayne says a lot with his face while holding his tongue against Thursday’s choices. It’s only when the stakes are clear that he must try to save the doomed men. Fonda is known for playing friendly characters, but he’s well cast as the humorless, arrogant Thursday. During the dance sequence, he executes a series of silly moves without cracking even a tiny smile. He’s all business and can’t see the downside in sticking so close to his by-the-books approach. The questions about heroism and legends were ahead of their time in 1948. Even when evidence points against it, we still expect Thursday to do the right thing. Ford shows his many opportunities to back down, but that requires different thinking. He also gives depth to the Native Americans, who aren’t itching for a fight. They’ve been swindled by a corrupt cavalry agent, and they won’t back down. The dominant score feels less modern and distracts from the action on the screen. There’s also a strange moment where O’Rourke proposes marriage after spending just a few hours with Philadelphia. While it’s not a surprise for this era, it’s still a strange moment that takes you out of the main story. 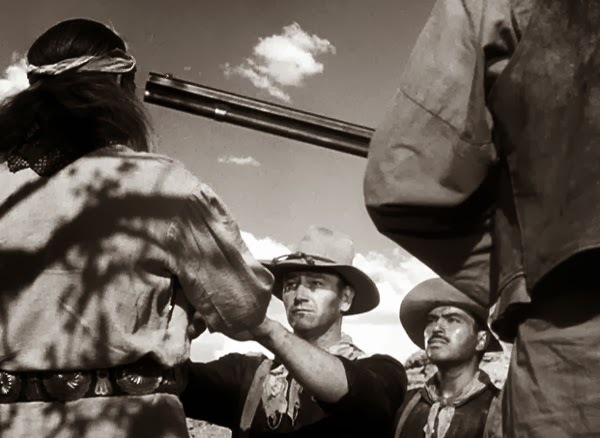 In his Ford biography Print the Legend, Scott Eyman calls Fort Apache one of Ford’s “most complex creations”. Does that approach lead to a successful film? It’s surprising to note the different beats that Ford and Nugent try to hit within this film. They take their time and spend a large portion just showing daily life at Fort Apache. Supporting characters come and go, and it isn’t clear where the story is headed. Some of these scenes are slower and less inspiring, but they make sense once we reach the climax. Watching Thursday lead the cavalry to their destruction is a gut punch and a big surprise. His frustrating inability to understand the situation (and subsequent martyrdom) bring added layers that support Eyman’s points. 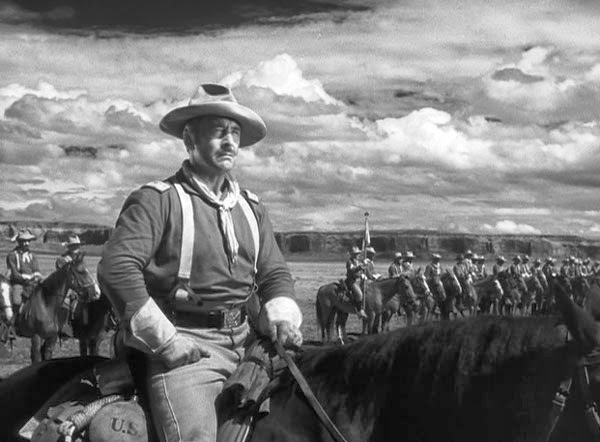 I wouldn’t call Fort Apache my favorite Ford movie, but it left plenty for me to ponder after the credits rolled. Ford shows the honor of the individuals in the military while criticizing the actions of the larger entity. Thursday embodies that inflexible mindset and conveys a theme that rings true for us today. Next week, I'll start a new marathon of modern black-and-white films. 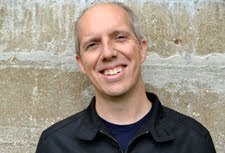 My first choice is Much Ado about Nothing, from a man you may have heard of named Whedon. I watched this a few months ago for the first time, and had many of the same thoughts. For some reason I really enjoy stories about people caught between two types of warfare - like WWI when people were faced with machine guns for the first time and old-school warfare just wasn't going to work any more. It's kind of the same with Thursday, who's expecting a type of battle that's just totally out of place in the West. It's a far more complicated and subtle movie than I expected, somehow. Great point about the difference in battle styles, which I barely addressed in my review. Thursday expected that cavalry men were just better fighters and could win despite their inferior positions. He just charged ahead and never considered that it wouldn't work in that environment. I struggled for a little while to get excited by the story, but it really picked up for me in the last act. Good review, Dan. Is indeed interesting, how despite his disastrous tactics, Thursday is set up as a hero. Considering wikipedia claim that it "was one of the first to present an authentic and sympathetic view of the Native Americans", I was surprised the love story, parties, singing and dancing took up most of the running time, and how underdeveloped the Native American characters are. Yet it is tricky to flesh out a character, if they can't speak English. 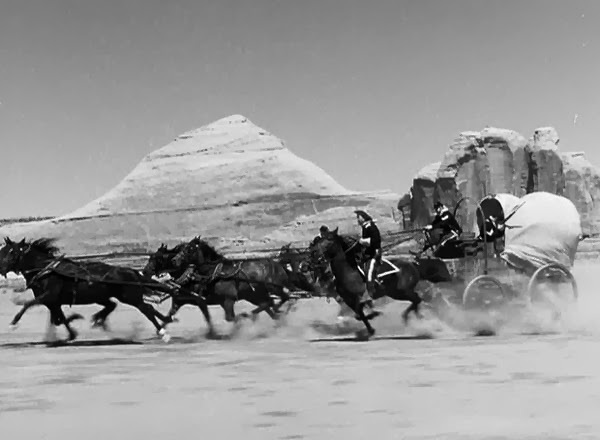 It was like John Ford waited until the last 30 minutes to deal with the main conflict. Maybe my expectations were wrong, and it was supposed to be about the Americans at the fort. Chris, you really hit on the challenge with evaluating this film. For a lot of the running time, it's just showing what's happening at the fort. Some experts love that aspect, but it does sort of bury the lead. John Wayne does a great job, but he really doesn't come to the forefront until the last act. The portrayal of Native Americans is better mostly by comparison to the films of the time, even those from Ford. They come off like smart people who aren't just around to be the bad guy. Still, I agree that it's a pretty limited portrayal.